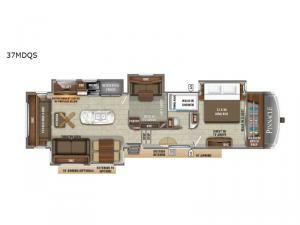 Traveling with your family at the peak of comfort and luxury is where you will be in this Pinnacle fifth wheel. This model delivers a unique layout with a private den/office that you can use for play or work, and with the addition of an overhead loft, your kids will certainly be excited to call this space their own. And you will be excited to have a space to call your own with the front private bedroom. Rest peacefully each night on the Jayco-exclusive luxury sleep system and store all of your belongings easily in the large walk-in closet. You will also look forward to gathering with family or friends in the central living area because of the spacious atmosphere that is made possible with two opposing slides, and the ceiling fan will keep everyone cool and refreshed throughout every visit.